Outfest — the Los Angeles-based nonprofit organization that promotes equality by creating, sharing, and protecting LGBT stories on the screen — has announced the complete programming lineup for its 31st Outfest Los Angeles LGBT Film Festival. The nation’s leading LGBT festival will be held July 11 to 21, 2013. As previously announced, Outfest 2013 will open with Kyle Patrick Alvarez’s “C.O.G.,” based on the short story by David Sedaris, on Thursday, July 11. 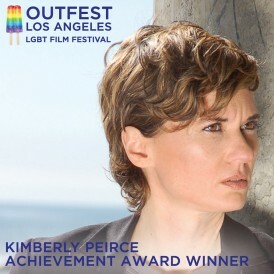 Prior to the opening night screening, the organization will honor writer-director Kimberly Peirce with its 17th annual Achievement Award. The festival closes on Sunday, July 21, with Darren Stein’s comedy “G.B.F.,” written by Outfest Screenwriting Lab Fellow George Northy, and starring Megan Mullally, Natasha Lyonne and Andrea Bowen. For more information and for a complete listing of films in the Festival, log on to www.outfest.org/fest2013 or call 213-480-7065. Posted June 15th, 2013 & filed under Entertainment.